Well... we worked all afternoon, evening, night, and morning to get the early beta released, and now it's here. Note, when I mean Beta, I really do mean early Beta. Please report any bugs you find. The only side of the server open currently is the prison system, so go ahead and check it out. Known Bugs: The rankup signs are glitchy, we're looking into a new ranking up system. Be sure to take a screenshot of yourself when you rank up. Thanks go to Ask_Yo_Mama for building spawn, the prison, and everything else. He's done an amazing job, and I will be perfectly honest. Without Ask hopping in and working on spawn etc, I was feeling discouraged enough to not make Fenix 2.0. So thank Ask for Fenix 2.0 just as much as you would thank me, or Nate (n8_c00). Thanks go to n8_c00, new co-owner, and the guy who has spent weeks working on the permissions, and is still working on them. Seriously big thanks goes to this guy. Permissions make up about 90% of the server's programming, and he's done pretty much all of it. So seriously, give him some applause. Thanks also go to Funny99Man for being around to help out. Thanks also go to BeeAngel for helping out in construction. Thanks also go to CBRINKERHOFF for being the server's guinea pig, and dieing repeatedly for the sake of the server. Welcome to the Early Beta of Fenix! It's only gonna get better from here. Hey everyone, Nate here. I'd just like to take a moment to expound a little bit on what Juran has covered. 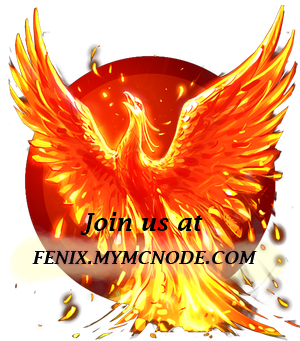 ASK, Juran, myself, and several others, have worked for over a month doing a host of things to what was (formerly) the Fenix test server, to bring the Fenix community a new experience that implements several new components to what regular Fenix members are used to. I'm going to be writing up a more comprehensive explanation of exactly how to navigate the new Fenix, but for now, consider this a brief introduction to the new server and how to navigate it. Most notably, we now have a Prison gamemode. I'm sure eveyone here is familiar with how a prison server works, but, we're in beta at the moment. Which means for the time being, things might not be as intuitive as they'll eventually be, and for that reason, I'm going to break it down a bit in a latter section of this post. The second portion of Fenix 2.0 is something you all will be much more familiar with, which is survival (paired with a touch of rank-based economy, and a dash of mcMMO fanciness). Furthermore, you'll be able to claim/protect your various things by making use of GriefPrevention, which is a plugin that Juran had found offering the most comprehensive and solid region claiming system I have seen since WorldGuard - and that's going somewhere. 150+ unique groups have been configured thus far, complete with male and female variants of each. Like the old Fenix, your objective when playing in the non-prisoner (or "Free" gamemode as we have taken to calling it) is to work your way up through those ranks. We'll eventually get to the point where ranking up will be fully/semi-automatic, but for now, that's broken. I'll be taking some time to configure and troubleshoot auto-ranking as soon as tonight, so, don't fret too much about that. Your objective as a Prisoner it to rankup until you reach the "Wanderer" group, which is the starting group for the "Free" permissions ladder. You have the choice of being Free at the very beginning, or going into the prison and graduating from it to collect all the perks inside prison. However, once you make a choice, you can't go back on it - unless you reset your rank, in which case, you must start over again. And finally, Wanderer - at which point, you'll continue playing as a Free player in the survival portion of the map. Each rank costs an increasingly greater amount than the last, and like other prison servers, you'll take items farmed/mined from the various farms/mines available to a Command shop, where you can sell them to bankroll a new rank. If you encounter any bugs, please bring them to the attention of any of the staff by making a thread (or responding to this one) or if you have it available to you, contacting Juran or myself directly. Or, "/mail send <username>" if you're so inclined. Have fun, I'll see you all on the server! Undoubtedly many of you are flooded with questions. Who is Nathan? Why is he all a sudden a co-owner? What did he do to deserve this? Why on earth do you trust him? He doesn't even know anything about Fenix! To those questions, I will respond with a somewhat shortened history of where I met Nate, how I met him, and why I trust him today with the server. To do this I will start from the beginning in which me and Owl are looking for a server hoster. We finally settled on CubedHost, due to the various good ratings about them. I starting making Fenix 1.0, and you all have seen the result. Fenix 1.0 lived a long and eventful life. Filled with some of the most massive farms that have been seen on minecraft servers. Filled with the best players minecraft could find, and blossoming with the best gameplay I have seen in all my years of minecraft experiences. Many of you remember the days in which Fenix was going through terrible lag spikes, block lag, and other issues. It was during these days that I contacted CubedHost, and asked for assistance in diagnosing what could be causing the lag spikes. Instead of simply responding with a typical short written reply, or ignoring my ticket almost completely, instead Nathan came in person to our server. He fit right in, diagnosing the issue, giving theories on how to solve the problems, and doing his best to aid us in keeping our server wonderful. Getting no-where, he shared his skype information with me, something that to be honest was completely out of line for him to do. It went way beyond his professional requirements, and frankly was a gesture that to this day I don't quite understand. After spending several hours on the server, we finally diagnosed a solution to the problem, and implemented the spigot server wrapper to our server instead of bukkit. Ever since then our server has been running much better. He told me specifically to contact him should problems arise again, which soon they did in the form of the notorious block lag. Placing three blocks would cause one to disappear. Once again, he came back eager to help, and we tried dozens of possible solutions, ranging from the likely scenarios, to the extremely ridiculous but however unlikely, could be possible scenarios. In short, we tried everything to solve the lag, and once again he spent hours helping me solve these issues. To this day our server is running smoothly largely due to his efforts on those days. When I asked him how much he had earned in money for spending well over 6 hours aiding us on our server, he simply responded "Around $.75 cents." Needless to say, his work ethic earned my respect that day. From there, we became friends, talking regularly, discussing random things, and even more recently throughout the last several months, we have become quite literally nightly buddies, playing various games, conversing about various details. Through his recommendation I applied for a job at CubedHost, and am also now a support staff of theirs. We have become quite close, as client to staff, friend to friend, co-worker to co-worker, and of late, brother to brother. I speak to him pretty much every single day. I probably know more about his life then his own mother. While it may be said that he doesn't know anything about Fenix, it can easily be said that he knows more about servers, plugins, and java programming in general then I do. We both share many of the same views about how a server should be run, and are determined to follow through on it. So to answer your questions in a concise manner, I will state them below. A: The closest thing to an online brother I've ever had. Q: Why is he all a sudden a co-owner? A: He has been helping out behind the scenes of Fenix for nearly as long as Fenix has been up, it only seemed right to give him a co-owner position, and bring him out into the light. Especially with his interest in doing more then simply keep Fenix running. Q: What did he do to deserve this? A: Let's start with working hundreds of thousands of lines of code in working with our permissions plugin to get it working smoothly. Not to mention the hundreds of hours he's placed into the server just these past two weeks. Q: Why on earth do you trust him? A: I have known him for nearly a year, and in all that time I've seen nothing to make me discard my trust in him. Q: He doesn't even know anything about Fenix! A: What he may not know in Fenix's history, he will make up for in Fenix's future. The history, is the history. A story be told, cherished, and remembered. Mistakes to be learned from, and avoided, memories to be pursued, and plans to be made into reality. The future is where all these things become true, I say he's proven his worth in attempting to make the future a reality. And come join us on Fenix 2.0 Beta! I would like to welcome our new co-owner Nate to Fenix. Juran speaks highly of you and I trust in time we will all get to know each other better. I also want to say a big thank you for all the time and work that you have and continue to do for Fenix. We appreciate everything! I would also like to thank Juran for all your time and hard work, I know you have put many hours into Fenix since the very beginning and continue to do so, we appreciate it. Thank you Juran for being a great owner; thank you for all that you do to make Fenix such a great server. A big thank you to ASK_YO_MAMA, for being the one responsible for nearly all the building of the new spawn and getting everything ready for the prison part of the server. You have done an AWESOME job! Couldn’t have done it without you. Thank you for stepping in and helping so much. We appreciate it! We appreciate each one that helped, thank you for being part of Fenix! I hope the future will give us all many happy hours to spend together to make a great Fenix server and community. As those of you who have been playing the server have noticed, we've been tweaking the prison system quite a lot these past several days. This tweaking was primarily to fix the economy stabilize what we were planning on the prison, and fix dozens if not hundreds of other imbalances and bugs. Changed the price of nearly all shop items to fix the ridiculous imbalance of the economy, and make ores the primary money maker. Changed the prices of the ranks to reflect the new economy changes. Added an Enchantment table to A block. Added a Haste 2 beacon to A block. Removed the permission /pay from all prisoner ranks. This was done to prevent prisoners from funneling money to outside accounts. Due to the fact that the prison system is drastically overpowered, especially on levels B and A, there was an extreme imbalance between outside mining, and inside mining. Essentially we needed to fix this imbalance, and there was no way to do it without either introducing a lot of complicated new plugin new economy new currency different currency stuff, or simply removing /pay. Removing the permission seemed... quite frankly... a lot easier. Removed the idea for trader shops/smugglers caves between the prisons and the outside world. While this idea has a lot of good merit, and everyone loves it, it's rather a killer for both sides. The outside world is going to have unsafe enchantments which would simply make the prison stupidly ridiculous. And the prison has WAY too many ores, simply put one person in the prison could flood the entire outside economy with every ore imaginable. Instead of making the prison more boring by removing all these extra ores, we decided to simply for now until a better solution has been offered, get rid of the smuggler's idea. In short, I'm announcing the prison to be more-less complete. Next up is the wild ranks! Subject: Re: Fenix 2.0 Beta released!